Is your brand using Snapchat yet? As a brand manager, or agency lead, are you up with it (or down with it, as teens would say)? Do you what the whole Snapchat buzz is all about? And are you aware that some of the world's biggest brands like McDonald's, TacoBell, Evian, Mercedes (yes Mercedes), American Apparel, Intel all use Snapchat effectively? What is Snapchat? Who uses it? Snapchat is a 'photo sharing app' that allows users to take photos, record videos, add effects, text or drawings, send 'snaps' to controlled groups of recipients. 'Snaps' last between 1-10 seconds. 'Snap chat stories' – the ones brands usually use can last between 25 seconds to 24 hours. Snapchat users are usually in the 13-24 age group. Most are iPhone users. They share funny photos and videos, their everyday life moments and thoughts, their moods and fancies. They share 400 million + snaps daily. A high percentage of snapchatters are women. How does a brand use snapchat? It's the immediacy factor of snapchat that makes it so cool. The action and reaction is in there here and now. Keep it fun. Brands can use it to tell interesting stories. Anything that's a scoop works. A secret, a quick news burst, a limited time offer. You can have games and contests on Snapchat. Use endorsements. Highlight launches. Use celebrity updates around your brand. At the end of the day, your brand has to have a sense of humor. You have to be able to react quickly, to what's happening around you. And take risks. But the first real step is to create an audience for your brand. 1. Build an audience, a Snapchat community. It may not be difficult to get people to watch your snapchat stories, but what is key is to build a community around your brand that will engage with your stories and share them. Building a cooperative, participative audience requires your brand to become a source and a connector of everything that's cool. You share. They share. Simple, really. 2. Share your brand Snapcode everywhere – on all your social media and more. Your unique Snapchat identity is called a 'snapcode'. It is a unique QR code. When your unique code is scanned in the Snapchat app, people can find you and add you and of course, follow you. 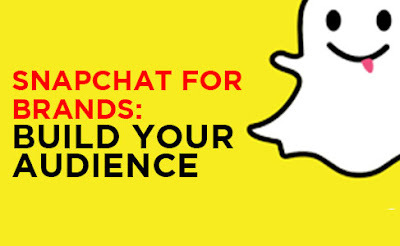 Spreading your Snapcode is probably the quickest and easiest way to build an audience. The more you share your code, the better it is for your Snapchat efforts. Share it on all your social platforms. Create stickers with the code on it, put it everywhere. How about a t-shirt? This is beyond just sharing your Snapcode. This means creating posts, videos, links on websites that shares your Snapchat experiences that lead to Snapchat. Is your Instagram pointing to Snapchat occasionally? Do it. Twitter mentions also help. It's the 'have you seen our latest on Snapchat' factor on all your social content that will help. 4. Collaborate with other users and brands. This is another cool way. Reach out to a keen Snapchat user who likes your brand and create something together. Have fun with that. You can even collaborate with associated brands – either under your group umbrella, or even that have some sort of alignment with what you do. If you spot another use who has a sizable audience, you can even do a Snapchat "takeover". It's when you literally switch accounts with that user. It's a great way to grow your audience, but you must be careful here not to tread heavily on your brand's intent or values. But yes, it is a cool way. See more on Snapchat "takeovers" here. Marketing-wise, you have a plethora of options when it comes to timing. You could expand and add to an existing campaign, create a Snapchat-specific campaign or even time it to be seasonal with creative holiday or event driven “Snaps”. Sending “Snaps” around special promotions or events should help drive traction, especially if you include an exclusive coupon or freebie. Timing is everything. You don’t want to overload users with spam-y “Snaps”. If you have a lot of great content to share, create a Snapchat Story. This allows you to build a fluid narrative through multiple “Snaps” that users can view for up to 24 hours. According to Co-Founder and CEO Evan Spiegel, Snapchat users send 400 million “Snaps” each day. The number of photos shared has skyrocketed from 20 million in October 2012 to 60 million in February 2013, 150 million in April 2013, 200 million in June 2013 to 350 million in September 2013. As marketing on the app is still fairly new, huge opportunities exist for companies that decide to take the leap now. Not only will you be able flex your creative muscles, but your campaign may also prompt media coverage, expanding reach and visibility for your brand.